I am going to show you how to build, rank & bank an Amazon affiliate site from start to finish. I am going to build an Amazon affiliate site that will make $100 a month. How good would it be to add an extra $100 a month to your salary any time you want to? With small things comes big things, build enough small sites that rake in small amounts you will end up with a decent passive revenue stream. I am not going to go for a $2000 a month niche site, simply because I would not want to reveal any niche of this quality here. I am going to show you how to find a niche that will make you money, simply because they are easy to rank in Google search. I am going to use Amazon.com and rank my Amazon affiliate site no. 1 on Google.com. The first part of the process is the most important, it can take days, weeks and sometimes months. To find this niche it took me 1 week. Of course I was not looking for 8 hours a day, I did some keyword research when I had some spare time. I would say that I did 1 hour keyword research every day for a week in order to find this niche. I know this is a great niche because the sites that rank no. 1 for the selected keyword are weak, I can certainly out rank them and make a little money from doing so. To start off you need to find a profitable niche that has keywords that we can be certain to rank no. 1 for. Then we can start making some money from those lovely Amazon commission cheques. Do not rush the first step, this will make or break your site. This part will determine if you make some money, or very little money. If you can’t find a niche in the first few days, do not panic and rush into any niche, this will be your downfall. The key to making money online through Amazon affiliate sites is preparation and planning. Follow this guide step by step and you will be making loads of money too. I also need to make it clear that “relevancy” is very important. Your content has to be relevant to the keyword that you are trying to rank for. This will make sure that you have a low bounce rate, it will help you rank no. 1. A Bing Webmaster account. Sign in here. Do not rush this step, if you do you are doomed to fail. Take your time here, plan everything down to the last detail and you can be certain that you will develop a money making Amazon affiliate store/review site. Open Amazon.com in another browser window. We are looking for high value products, preferably around $50 to $100. However the amount you make is all relative to how many monthly searches your keyword gets. So a low cost product can still bring in a decent affiliate cheque every month if it gets a lot of monthly Google searches. When we find one, we are going to quickly analyse the competition of the niche using MozBar within Google search. If on first glance the niche appears too competitive we will not even go into keyword research, we will move onto another product/niche. Before we start you want to build a site around buying keywords. We want people to get to our site that are at the end of the sales funnel and are ready to buy. Now I will reveal how I find a product to develop a niche site around. I use keyword.io for this. This is a free to use tool, each and every tool that I use in this process is free. Enter one of the “buying words” into the search bar. Make sure that you have “Amazon” selected and your location. I am building a “USA” Amazon affiliate site, so I have selected USA. Now hit the “search” button. Scroll down to take a look at all those lovely buying keywords that people have been searching for on Amazon. Now we need to find out which ones have a decent product price, are popular and are easy to rank. Select a keyword from the list and head on over to Amazon.com. I had to do this over and over and over until I found the keyword that I am going to use for my Amazon Affiliate site here today. This process is the most important part, do not skim over it, or your new niche site will be a waste of time and effort. Enter one of the keywords in the search bar and take note of the best selling product price. The keyword I have chosen “best epilator” has a product value of $28. There are more expensive models which are popular too at around $100. This is a great little niche to look into. Make sure that the products have good reviews. We also want a product that will sell all year round. Do not go for a season specific product like Christmas jumpers. We want steady affiliate commission cheques each and every month. This is going to take some time, I can’t stress this enough. Do not rush this step. Next I need to know if this buying keyword gets a lot of monthly searches. I always use wordze.com for this, it is quick and easy. Click on “ultimate research” then enter your keyword, choose a name for your project, select the country you are targeting and hit the search for keywords button. Okay, so my selected keyword has a pretty high product price and a fairly high search volume. This keyword looks promising, now I need to asses the top ranking sites for this selected keyword. Can I out rank them? Keep this window open, we are going to use Wordze.com again a little later on. To do this quickly we are going to use MozBar and perform a quick Google search. How do I know that this is an easy to rank keyword. Well first of all I am looking at the number of backlinks that each site has. If the majority of the sites have less than 50 backlinks then I know that I can out rank them. Then I take a look at the “PA”, if most of the sites have PA under 40 then I know I can out rank them. For my selected keyword “best epilator” there are sites ranking in the top 10 with zero backlinks and a PA score of 1. In fact there are 3 sites in the top 10 like this, I know that I can rank no. 1 for this particular keyword. Just to make sure we are going to run the keyword through some free keyword competition checker tools. If the score is low, we are going to move onto the next step. I use three keyword competition score tools for this. The first free seo keyword competition score analyser is over at SpyFu.com. SpyFu.com gives my selected keyword a ranking difficulty score of 29. Anything under 40 has low competition and is worth looking at. So my selected keyword walks through this test. The next keyword competition tool that I use is at kwfinder.com. We are looking for a seo competition score below 30. My selected keyword scores 26, and passes my next test. The final free keyword competition tool that I use is at keywordrevealer.com. Again I look for a competition score below 30. My selected keyword scores just 18. I am super confident now that I can rank no. 1 for my selected keyword. My next step is to work out how much this keyword is worth. I am looking to build an Amazon affiliate site that will bring me in at least $100, will this keyword do this for me? We know that my keyword gets 3600 searches a month, the top ranking site will get about 33% of this traffic. So I need to calculate how much traffic this will be. I now know that my site will get at least 1188 visitors for my selected keyword. Now I need to know what percentage of these people will buy an epilator. My conversion rate is never below 5%, so I will go with that for this calculation. I now know that around 60 people will buy something on Amazon every month being referred from my niche affiliate site. Now I need to know how much money I will make from each Amazon sale. We know that the best selling product in my selected niche sells for $28 and that I will get 4% commission on every sale. So I know that I will make $1.12 from every sale and that I will get around 60 sales every month. Now I can calculate how much this keyword is worth to me each and every month. I am certain that this keyword will net me at least $66.53 each and every month. To bump up my monthly earning for this little affiliate site I am going to create 4 more pages based around 4 more keywords. My site will have 5 pages that I am going to rank no. 1 in Google search. Now I need to find 4 more keywords. We need to drop back over to Wordze.com for this. Earlier we entered our selected keyword into Wordze.com and we got a whole load of keywords for our niche. We now need to pick 4 more keywords from the list. We will quickly analyse the competition using just SpyFu MozBar in Google search. Remember we want more buying keyword. Do not forget this. We want keywords where our web site visitors are ready to buy. So I found more keywords that I actually require, that’s even better. I will build an 8 page site around the selected keywords. I will build backlinks to the five keywords above. I will use the keywords below to build out the site, I will not build backlinks to these pages. They have such low search volume and are not worth the effort. I will use the extra keyword for posts on my blog page. I will also add extra posts to the blog based around “how to” keywords. I will use Yahoo Answers to find these. I am not fussed at how many monthly searches these keywords get for my blog section, they are purely to fill the site out and to drop internal backlinks to my five selected money pages. 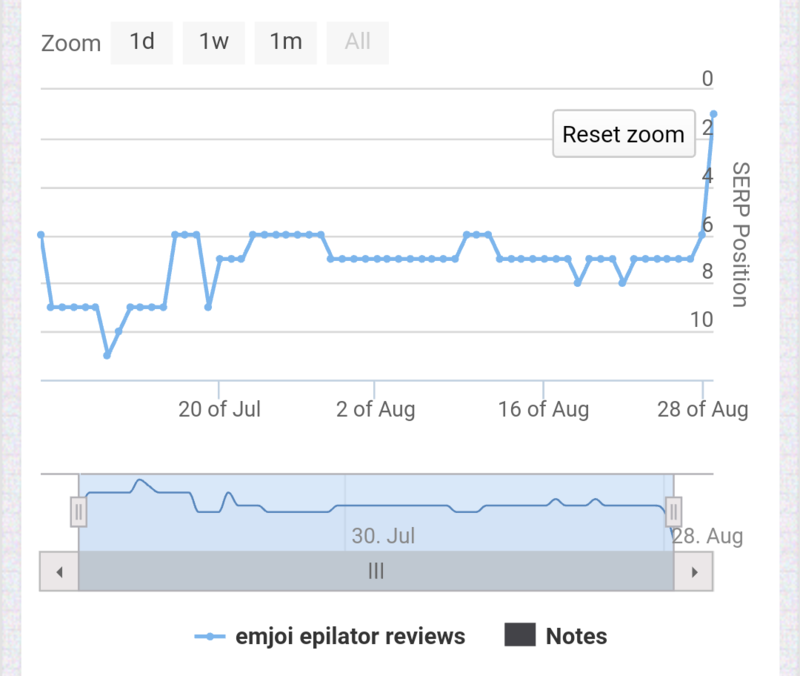 I am going to establish how much all the keywords are worth using the same calculation that I did above for my selected keyword “best epilator”. Of course this is only if I rank each and every keyword no. 1 in Google search. Which is exactly what I am going to show you how to do. I know I can rank each keyword no. 1 and it is going to take me 3 months to do this. The work will be minimal because I am going to outsource all the link building, for cheap of course. All I have to do is write 8 blog posts and I will have an extra $100 each and every month in three months time. The content has to be good and highly relevant to the selected keyword. Remember, little things add up to big things. Don’t be put off my a low monthly income niche, the more of these that you have, the more you will make. It’s not really the amount that we are going to make, it is really how easy the keywords are to rank that we are mostly concerned about. However you do want a decent return on your time investment. Before you buy a brand new domain you can look for an expired domain over at expireddomians.net. If you can find an expired domain with existing backlinks it will give you a little head start. Enter you main keyword into the search bar. Now we need to filter the results. First of all add a minimum of 10 backlinks and select “only available domains”. Now click on the “Adwords & SEO” tab and enter a minimum domain authority and page authority of 10. Then click the “Apply Filter” button. You will then have a list of expired domains with fairly decent metrics. If you like the look of any domain then you can take a look at its backlink profile using SEO SpyGlass. If it has a lot of exact match anchor text backlinks or spam Chinese backlinks then leave the domain alone. For my selected keyword there are very few domains available with decent metrics, also I do not like the name of them, they are spam domains. I am going to have to use a brand new domain name for this project. I am now going to head on over to NameCheap.com to get my new domain name. I use NameCheap because they offer free WhoisGuard. I want a brand domain name, Google loves a brand, so let’s give it what it wants. I want my main seed keyword at the beginning of the domain. To help you find a branded domain you can use bustaname.com. Enter your seed keyword, select your extension, I am going for a .com because I am ranking on Google .com. Now hit the “Go” button and select a branded domain name that you like. I like “epilatorly” so I am going to head on over to NameCheap.com and purchase that domain name. I will use BlueHost.com for hosting this site. So I will change the NameServers at NameCheap.com and point them to BlueHost. Then I will drop WordPress onto the domain and get cracking with the next most important step, writing the content. This is how you do the one click install, it is very easy to do. I always do the manual install, takes a bit longer and you have to set up the database yourself, which you can do, but if you are new I would not. Most of the time I set up my affiliate sites with my own custom made templates using Dreamweaver using flat html pages. They load up super fast, in this case I will use WordPress so that you can all do the same and follow along with me. Take a look at my affiliate site. Note how I have set things up and linked the pages together. These are the main ones that you will need. If you only get one then make sure that it is Yoast SEO. I have other security plugins, which you will not require. The more you have the slower your site will run. Okay, so we have our easy to rank keywords ready to roll, we have our domain name ready to roll with a fresh install of WordPress on there. Now we need to write the content. I will write one piece of highly optimised content around each of my selected keywords. Stick to this strategy for writing the content for your niche Amazon site and it will be highly optimised to rank no. 1 in the SERPs. This is what I go by every time, and sure enough it works every time too. Do not miss anything out from the check list. We need to make sure that our site is bullet proof. When you add backlinks to content like this there is only one way it can go, that is straight to a number 1 Google ranking. I am going to show you my 3 month backlink building schedule that I use to rank 5 keywords all at the same time. Over a 3 month period I am going to rank the selected keyword number 1 in Google search. It’s actually not a lot of work, it’s just annoying that it takes 3 months to achieve. Building backlinks slow and steady is the only way to go. Build them too fast and you will not get anywhere, be prepared to wait 3 months before you hit the top spot. First of all each of the five pages that I want to rank no. 1 for need social signals. Getting social signals is the first thing that you need to do for every page before you get any backlinks. For the social signals for each page I am going to use this gig on SEOCLERKs. For just $1 you get 1500 mixed social signals, it is the best package that I have come across. I am going to get 60 PBN backlinks from seo clerk to each page each and every month over 3 months. For this I use this gig. $30 for 60 PBN backlinks is very good indeed and definitely worth the money for sure. These are sure to rank these low competition keywords. There is another service you can use too, this one you get 40 PBN backlinks for $5. I will be using this service too. I am also going to send 10 Tumblr backlinks to each page each month. The Tumblr backlinks will come from expired blogs that I have re-registered, they will have high domain authority and at least 10 backlinks pointing to them. It is super important to mix up your anchor text. Do not use your exact keyword match anchor for every PBN backlink. I let the Fiverr seller do the content for the backlinks, it isn’t great, but the most important thing is that the backlinks index in Google search. I know that most of them will. I will index these backlinks slow and steady after delivery, 3 a day at the most. I will simply do a Google search “submit to Google” and simple add each PBN url to Google index. If they are indexed I will see the URL in the Google search results when I pop it into Google search. This is a super simple backlink strategy with limited work on my side as I am rather busy. You can track your ranking using the free software Rank Tracker. I will build 30 PBN backlinks to each post throughout September. I will do a ranking update on the 1st of every month. Watch these rankings rise as the backlinks start to flow. I will also add some blog posts for internal backlinks to really get things pumping good. After one month of backlink building we have achieved page 2 and page 3 rankings on all keywords. This is exactly where I expected to be, I am on target for number one ranking after three months. Each page got 10 Tumblr backlinks from different Tumblr blogs. I used this guy on seo clerks to scrape me some, I just had to register them. He gave me over 70 expired blogs for just $5, bargain. I got 30 PBN backlinks from the Fiverr gig, however I have found a better gig on seo clerks that I will use in month 2. I would have used it in month 1 too had I seen it earlier. I suggest you use this seo clerks gig for all your PBN backlinks. You get 300 PBN backlinks for $30, which works out cheaper than the Fiverr gig because you can give as many URLs as you wish, so one gig will take care of all 5 pages on my site. I wanted some interactivity on the posts so I purchased some blog comments from seo clerks. That’s it, not a lot of work to get page 2 rankings. I will continue to build the backlinks in month 2 and will make sure that the posts hit page one by the end of this month. Let’s find out how those backlinks have pushed epilatorly up the SERPs. As you can see we have seen some rank improvement. Not as much as I would have liked, but I have barely done any work to achieve these ranks. I am going to do some Web 2.0 tiered link building in month 3 to really push the site on, this is what needs to be done to hit the top spot. I am going to up my game a little in month 3, I will hit the top spot for the main keyword at the very least. The good news is that all keywords sit on Google page 2 after two months of backlinks. If I spend a little more time with this site I can push it to no. 1. The start of month 2 I did 10 high PA Tumblr backlinks to each of the five pages I am trying to rank. On average I managed to get 15 to 20 of the PBN backlinks indexed for each page. I also got a bunch of Web 2.0 backlinks using this service on seo clerks. I also got this multi backlinks package from seo clerks for each page, however they have only just been delivered…so none of the backlinks are indexed yet. That’s all for month 2. I didn’t do any work myself, just spent a few bucks on Fiverr and SEO Clerk services. As you can see, all keywords are on page 1 or 2 of Google search USA. I would normally be ranked no. 1 at this stage with any Amazon affiliate site I decide to build. With this project I took the lazy route, and the rankings have suffered. I completely took my eye off the ball, way too many exact match anchors indexed naturally, which has really hurt the rank of this site. Now I have some extra work to do in month 4. My exact match anchor text ratio was well over 30%, which is not good at all. My calculations suggest that I need a whopping 600 backlinks just to straighten things out. I have already got started on this, I will be using long tail anchors and branded anchors to get the site back on track. Hopefully at the end of month 4 the site will be ranked no. 1. I should have built all the backlinks myself using my web 2.0 backlinks strategy, the site would be no. 1 by now if I had taken that route. Instead I went down the lazy route because I did not have time to go with the web 2.0 backlinks strategy. In month 3 I got lots of high PA Tumblr backlinks using this service. You need to be very careful when ordering PBN backlinks, make sure that you do not get too many exact match anchors indexed. I got lots of exact match anchors indexed without realising that my “click here” “brand” and “URL” anchors were not indexing to counter balance them. Moving ahead, I will continue to build high PA web 2.0 backlinks indexing 20 a day, which I do not recommend. I am only doing this to correct my exact match anchor text ratio problem. The site will jump around a lot due to this, however my rankings will settle when I have solved the problem. In month 4 I had to index a hell of a lot of backlinks to bring down my exact match anchors. This in turn has pretty much destroyed the rank of this site. In month 5 I am not going to build any backlinks to the site. If I have time I am going to add content to the site focused around long tail low competition keywords. This in turn will start to bring in some traffic and most importantly some sales. You can track your affiliate earning in your Amazon affiliate account. There will be no sales throughout September 2016. The site is new and I do not expect anything. I will do a earnings report on the 3rd October 2016. As expected, no sales to report at the end on month 1. I will not expect any sales until my posts hit page one. I don’t expect any sales until the start of month 3 of this project. I did not expect any sales throughout October, but I actually got one, even though the site is not ranking on Google page 1 for any keywords yet. For the month of October I made a whopping $5.78. I will probably see a similar return throughout November until the site hits the first page of Google search at the start of December. I added UK Amazon affiliate links to each post. In November I got 2 sales, one from Amazon.co.uk and one from Amazon.com. In January I will have a bit more to report to you regarding earnings. In month 4 I will make sure all keywords are on page one of Google search. Throughout December the site made me a whopping $12.54. The site did not generate any UK sales. I sent you a mail. Hope to see your response soon. Thanks for the feedback, yes he has disabled his service, maybe he doesn’t want anymore backlinks on his sites. yep, make sure you do not index too many exact match anchors and you will be good to rank. Nick,you build only tumblrs in november ? Previously you had said that you are opting for Tiered Linkbuilding in november to push them into top spots ? How many percent exact match you use and feel is good, since the recent google update? I used to do 30% exact, 35% URL, and 35% generic, yet before I get to page 1 with a new site in 2-3months, google will penalize me for spam problems, which I don’t know where it is coming from. I am going to cover this in my next post in detail. Aim for around 10% exact match. If you have been using the web 2.0 backlinks strategy on 30% exact match do not worry it still works, you just can’t stay on that line all the time. After that you need to mix up your anchor text profile with long tail anchors. URL anchors will be around 10% too and generic will be around 5%. Don’t worry about what you have so far. My next post will give you a clear idea of where to go with anchor text. 1. You mentioned in the update that you’re going to build 600 links to correct this error, how are you planing to achieve this??? 2. Are you going to utilize expired tumblr backlinks ONLY or the pbn links or BOTH??? 3. how do you tend to fashion out other keywords anchor text distribution (i mean the % of url, generic, brand name etc) with the massive links you want build??? 4 according to semrush, epilatorly.com has over 400 links pointing to it in total, hope the addition of 600 links won’t be too much??? 5. with this update, what do you think is the ideal % of exact match keyword should be for link building??? Instant reply will brings hope. This little lot will get the job done. 2. I will utilise both. I will build high PA Tumblr and other web 2.0 sites and also get some cheap Fiverr PBN backlinks as mentioned in the post. 3. I am going to try and get exact match anchor text down to around 10% to start off with. I am just writing my next post now which will show you perfect anchor text ratio that I use right now, which is working really well for me at the moment. 4. I don’t think 600 links will be too much. Obviously I won’t get them all at once and index them all on the same day, I plan to index 20 links a day. The site will be jumping all over the SERPs, I expect that….then when my ratio looks like it should do (as it is in my next post) I will slow things down and push the site into the top spot. I am waiting for your next post. When will we expect next post because it seems after penguin 4 i am facing a huge issue of indexing my links (low quality content). I manage to get indexed but the next day Google de-index it. I am desperately looking for your post to stay update with latest Google changes. Next post will hopefully be published on Friday…. Good to hear from you nick. At first, i can’t wait to see your next post. Checking some of the Authority sites, i deducted that most of the them had anchor text of exact match keyword and keyword variation of 13% at most for majority of their keywords. I understand you have a lots of task ahead of you, hope you will create time to check the mail i sent you, I’m anxiously waiting for your reply. Thanks. I combed fiverr.com few hours ago to find .edu and .gov backlink gig but i couldn’t find any of better packages. Can you please recommend the good gig for me be it on fiverr or seoclerk, i want those links (.edu & .gov) on my website backlink profile for diversification. Thanks in advance. I have used this one before: 21 Edu and Gov Moz DA 50+ for $1 which was pretty good. These are just profile backlinks, but they are good for diversification. I ordered a while ago, just checked them now and the majority are still live. All have DA over 50, you can give one URL and up to 10 keywords, which is good. You can also provide a small description which will be used on a few. Wonderful tutors from Nick here. Kayode you seem to be from my country (i knew that from your name) Nick connect Kayode and myself lets work together harnessing the wisdom nick is giving us.. I noticed some of this PBN post are not manually created. And the keywords are not manually placed. Most of the PBN providers are using some form of software to bulk upload spun content to then, hardly any will be manual. The anchor text placement is random, which is good and bad. These backlinks can still give your site a nice little jump up the SERPs, not the greatest most powerful backlinks you will ever get, but you can’t complain for the price. If you want quality you are going to have to pay a lot more for it or create the PBN yourself. Hi Nick. You said “I should have built all the backlinks myself using my web 2.0 backlinks strategy, the site would be no. 1 by now if I had taken that route.” so the web 2.0 backlinks where you did the tier one and tier two backlinking wheel is actually better than what you did here? Hi Shannon, my improve Google search ranking is the best strategy for long term rank. I was very lazy with the Amazon site, I don’t have the time to dedicate to building quality Tier 1 backlinks. Had I done quality Tier 1 backlinks from web 2.0 sites with content done myself I am certain the site would be ranked no. 1 right now. What I have done here is the lazy way, too many exact anchors indexed from the PBN links which destroyed my chances of hitting the top spot in three months with the Amazon site. I now have to create around 600 backlinks to correct the mistake. Had I created the backlinks myself using Web 2.0 sites it would have been very easy to change anchor texts, you have full control that way. I have no control over the PBN links that I purchased for the Amazon affiliate site, so I need more backlinks to balance out the exact match anchors, which is going to take some time and effort to do. Create 1000 word plus quality content on Tier 1, link out to other authority sites (not your competitors). You can use new web 2.0 sites for Tier 1 to make sure you have your keyword in the sub domain URL. Then you can power them up with high page authority Tumblr backlinks, make sure you use Tumblrs with lots of backlinks pointing to them, then you don’t require any Tier 3 or Tier 4 backlinks. Thanks for your feedback. i will follow that guide. Also i did two web 2.0 backlinks for 2 pages on my website and those 2 pages are at number 18 and 16 in the SERP right now. so i know your methods really work. Great news…they do work if you put the effort in and don’t miss out any of the steps 🙂 Make sure you use the correct anchor text ratio and you are sure to hit the top spot. I have noticed that you have so many referring domains linking to your site compared to your competitor but still you are not ranking on the 1 page. For example the keyword “best epilator for face” you have around 100 domains are linking to this particular URL and this website (epilatorcentral.com/best-epilator-for-facial-hair) with the same keyword are ranking on the 1 page in 2nd spot with only 2 referring domains. I should imagine that you have send too…….many exact match backlinks. Also buying exact match domains with the same keyword are not good for ranking. It was good till 2013 or 2014 where we buy exact match domain and hits the 1st page but after that google have punished exact match domain names in that keyword. BTW I have checked backlinks with Majestic SEO. So are you not gonna focus on this site because you have spend so much money and your time to build this site. Also why keyword is not ranking now despite the fact that all 5 keywords are easy to rank as you have mentioned in this tutorial with different keyword research tool OR this happened because of lots of poor backlinks OR the keywords are not long tail OR something else. I am feeling very sorry for you at the moment. I hope that when I would build backlinks then I would not feel that situation otherwise I will be in trouble and I won’t be able to build backlinks then specially if I will get negative results. I haven’t really spend a lot of money on the site, it’s just not a good ROI compared to the many other sites that I have. I have to spend my time wisely and focus more on my big money sites. I will keep adding content to the epilator site, it won’t be as much as I would have liked, I should have put the time in to begin with really and I wouldn’t be in this position now. The keywords are not ranking because I used way too many poor quality PBN backlinks. I should have done my web 2.0 backlinks strategy adding quality content to the sites….or I should have got this premium web 2.0 gig…which is really what I should have done not having the time to do it myself..then I should have dropped the PBN backlinks to the new web 2.0 buffer sites….the web 2.0 then would have sat on the second page of Google search for my selected keywords and my money site would be ranked no. 1. I have paid the price of being lazy with this project….I should have picked a more profitable niche really then it would have been worth spending a little more time on it. Go for quality backlinks….put the quantity on Tier 2….only index 10 backlinks per month indexed slowly over that month and you will be good to rank. I indexed way too many backlinks each month….many had exact match anchors too…which let the rank slip….it’s good that everyone can learn from this…it’s also good to know that less is more these days…. This post really validates your trust worthiness. I read to many SEO experts articles that talk about ranking sites like they never make mistakes. The only give the good results. Which of your strategies would you recommend for completely new site on a domain that was never registered so brand new. I see you don’t recommend PBN links but for some of your journeys you did use them so I am little confused. So in short, which strategy outlay from your posts will be best for brand new site, also you can mention 2nd best. I highly recommend my improve Google search ranking strategy for a new site. It’s quite a lot of work, this service will help you out with the web 2 building if you don’t have time. The web 2.0 backlinks strategy is also a good option, any will do the job. 1. Never include exact match keyword at the beginning of link building. 2. Even if the keyword is easy to rank, if you build too much links within short period of time, you will suffer ranking on SERP. 3. The LESS of quality links build with good anchor ratio the MORE the high ranks on serp. Nick, i found a keyword with kc of 12 (on keyword revealer), i wrote 2,500 words arround the keyword then post it on my website. I indexed the post with google console and my website ranked #21. I added 2 expired tumblr links the following day. After like 3 days later, i couldn’t find website on serp whenever i google search the url of the post. Is it normal or what do you think i have done wrong??? 1. Yeah it’s good to play it safe at the start of a link building campaign…you are better off going with long tail anchors at the start. 2. That’s true, slow and steady always wins the race eventually. You need to do link building over 3 months, look at the bigger picture. 10 to 20 backlinks per month is enough. 3. Correct. Less more quality backlinks with unique content on them will index and remain indexed. If you put the effort into it you will hit the top spot for sure. 4. Most definitely….it is going to take 3 months. If you have super low competition keywords you can hit the first page without any backlinks at all, however it is still going to take 3 months to hit the top spot. Hey Nick, thanks for the guide. I have a question about indexing backlinks with google url submit. Is that safe as you know we are telling google that these are our backlinks we want to index? If that ok can we also submit tier 2 backlinks or it’s not recommended? Love the thoroughness of your posts – this one in particular is one that I have bookmarked that I am using for my keyword research and competitive analysis!! 1) Are you a part of any Amazon Affiliate Mastermind groups or Skype / Facebook Amazon groups? Wonder if you can recommend any that are pretty good for collaboration. 2) Also, I’m really curious to hear your thoughts a little deeper on the content strategy that you prefer (and how it correlates with the long tail keywords that you discover). From your analysis, it sounds that you prefer hyper-targeted posts that pretty much revolve around one long tail keyword (at least 2,000 words). In the niche that I am operating in, I’ve seen for quite a few keywords that the top results are generally posts that have about 7,500 – 10,000 words of content (buyer’s guide), and they’re so comprehensive that they pretty much cover everything. From your experience, do you prefer going with the long tail approach of writing a 2,000ish word review that essentially chips away at a part of their buyer’s guide, or basically replicating what Google is proving that they like and find to be the most valuable? I normally don’t see a ton of people that will take the time to write something that is *that* comprehensive/thorough, but the ones that do are at the top. Let’s say it’s an authority site, and they have a page on “Best Epilators” 😉 . On the page, one sub category that they have is “Best Epilator under $100” and “Best Cheap Epilator”, and lets say that each of those long tail keywords have search volume of 300 searches a month. For each sub category they’ve basically written 200 words with a product review. They hit 10,000 words by including features of what to look for in an epilator, as well as a bunch of product reviews, and sub categories (i.e. best epilator under $100, best epilator under $200, best epilator under $300, best cheap epilator, best premium epilator, best epilator for women, best epilator for men, best epilator with foam grip, best curved epilator, best electric epilator, best battery powered epilator, best epilator made in the US, best epilator set, best epilator brands, and so forth) until you have this massive guide. In your approach, would you prefer to make individual posts that are solely optimized for those keywords, and inner-link to one another: “Best Cheap Epilator” and then a separate post about “Best Epilator under $100”, and so on for other related keywords that may have search volume? So far I’ve been implementing the comprehensive approach, and simply including long tails into the content (using a table of guide plugin to make it easily navigable at the top). I’d really love your take on this, and perspective. Maybe you haven’t mentioned it because of conversion reasons, or something else!! 2) By the way, do you have a coder / Fiverr gig that you could recommend for TablePress Optimization? Love your posts, and can’t wait to read your feedback. I’m sure it will help many other readers as well! It’s awesome that you take the time to read all of your comments and actually share genuine insight! 2. You are spot on there, I like to target buyer keywords (the longer the better) and focus on one keyword per content, always aim for at least 2000 words. Most of the time I don’t add any LSI in there…If you are clever with your anchor texts you can rank for other related LSI low comp keywords with ease for the same content. If I saw a guide ranking no. 1 with anything over 3000 words that is established and looks good I will pass on that keyword, I search for keywords that don’t have anything of awesome quality in the top 10 results. You can build up 5000 to 10000 word guide over a few months, first publish a 2000 word article and then add to it as you discover more facts on the subject. It’s unlikely that anyone will write such a comprehensive guide in one go. The best way to go is to build a brand/authority site, this way you will add content to the site on a daily basis and rack up the content…when you have covered all the main keywords you can start to build up the content that you already have….with that you are guaranteed to get natural backlinks and in turn rank up. The best epilator site is not a typical site of mine, it was done as a mini site…I don’t have the time to spare on it and have some big authority sites working well for me which take up just about all of my time. I try to squeeze in a few blog posts on Rankers when I get the time to do so, which isn’t as often as I would like. Also I will send you a mail so you can link me up with Kayode10 as a country man.. I noticed it was on its way back up the SERPs 🙂 I did some anchor text modifications and it has done the trick for now. Changed some exact match anchors and also dropped some more backlinks….I will leave the site now for a few weeks and watch it rise up the ranks. Send me an email…I will email Kayode with your details. Which is a reliable keyword difficulty tool. the same keyword with keyword revealer I get 12%. Nope, they are just a guide. You have to do your own competition analysis. First of all use the tools to find keyword ideas and get rough idea of the competition score. Then you need to search the keyword in the search engine that you want to rank on. You are looking for sites in the top 10 ranks with few backlinks (few linking domains) eg lots of links from one platform alone is not good, thin content, exact keyword not in TITLE TAG or URL extension. Use MOZ BAR to help you do the checks fast. if you want to sell it,how much it will worth? This site is only worth the time and effort it has taken me to set up and write the content. The site does not make a lot of money at the moment, so it’s just my time. When a site is earning money you would pay what you are willing to wait for a return on your investment, this will be different for everyone out there. By that I mean for example, if a site is making $1k per month am I willing to pay $12k for it? I would have to wait a year before I start to see some return on my investment, that’s all of course the variables remain the same. The site could well take a drop in the SERPs and the revenue could fall, also the site could make more cash if I added new content to it. Value a site based on time you want to see a ROI and the quality of the backlinks, will the rank hold? It’s always a risk buying a site, keeping a short term for ROI keeps the risk low. I will do this later today for you guys, sorry I haven’t done it for a while, I have been really busy. All done in a previous comment, no real rank improvements as I have not spent any time on the site. The site has made some money, not a lot, however it is ticking along quite nicely. I will drop some more backlinks to it soon and do a full break down about what I have done. Hi Caitlyn, epilatorly has made me $37.50 this month so far on Amazon USA. On Amazon UK it has made me nothing so far this month. The best epilator post is currently ranked in position 24 on Google.com….I have not put any time into the site. It has the potential to hit the top spot and when I have time to do so I will get it pushing ranks. why did you switch the domain hosting to bluehost? i believe namecheap is offering also a hosting for a cheaper price (annually)? greate post as always, my question is, which wordpress theme would you recommand for wordpress? I highly recommend the Optimizer theme, it’s so easy to customize and it’s free too. You don’t need to create your website before you register to be an Amazon affiliate. Make sure you register a domain and drop WordPress on there and your application will be accepted. The only video I can find for customising the Optimizer there is this one, it’s not the best. Pretty much everything can be done with ease through the Appearance—-Customize section in your WordPress dash. I recommend registering your domain name, dropping WordPress on the site before you add it to your Amazon affiliate application…you do not need to add any content to the site. Can you do an update on traffic, earnings, overall, it has been almost one year since the site has been live. The site makes $40 to $60 every month. I have not had time to work on the site to be honest, which is why there has not been an update. I didn’t put a lot of work into the site, the earnings will continue to rise as the site ranks up on its own. I don’t intent to do any more work on the site in the near future.